The spreadsheet contains sample data that must be analyzed. 2. Create new sheet called "My employees". 4. 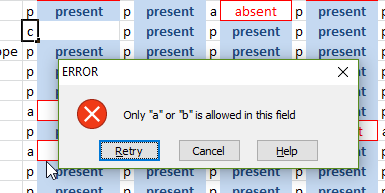 In E column, insert data validation, where only "a" or "p" letters are allowed. Define ERROR window (second image)that is displayed when outher value is entered. 5. In F column insert function that displays: "absent" if "a", "present" if "p", empty if no value is set in E column. Row: 33 and 34 - use COUNTIF function. 9. 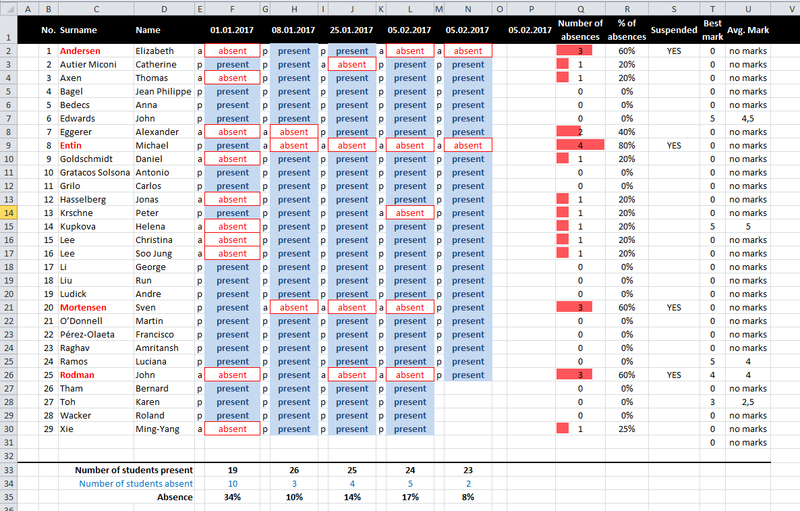 Count percentage value of absences in column R.
Use SUM of COUNTIF functions to get total number of meetings. 10. In S column display information if student is suspended. Suspension when student has more than 50% of absence. 11. Change Surname color in column C to red, when student is suspended. 12. 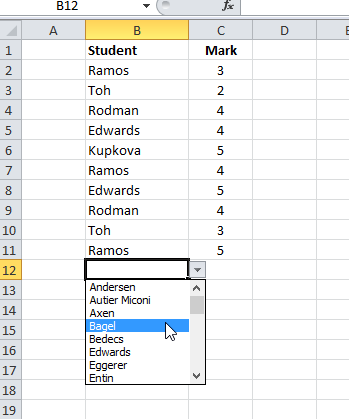 Go to sheet named "Marks" and create two columns headers "Student" and "Mark". 14. Add data validation for "Mark" column, where only Integer values from 2 to 5 are allowed. 15. Input some marks for random students. 16. On "Students" sheet define formula that displays best mark of the student in T column. Search within marks saved on "Marks" sheet. 17. Display average mark of each student in U column. "No marks" for students without any mark should be displayed. Use SUMIF function to get sum of current student marks and COUNTIF function to get total quantity of student marks. IF function used with COUNTIF function in a condition statement can help to display "no marks" sign.